I’ve been listening to a lot of new music this year. Here’s some recommendations. 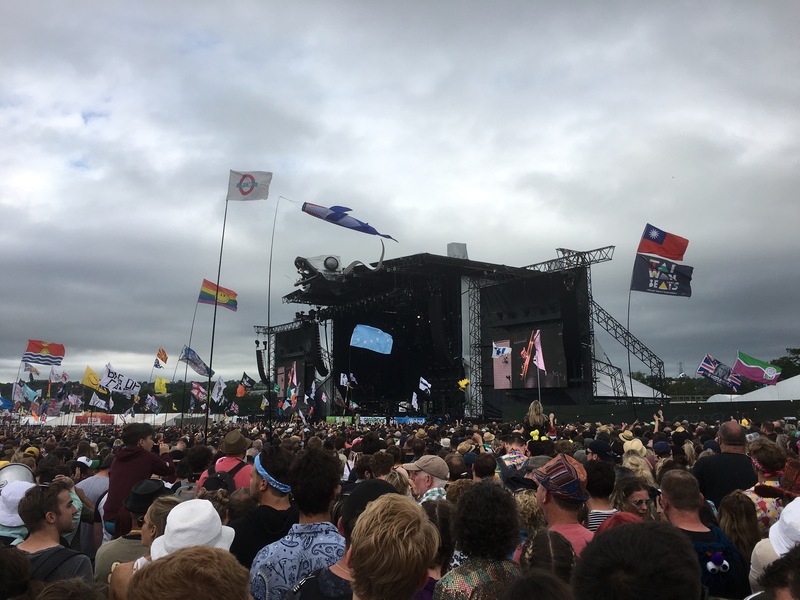 A cracking headline slot and a politically-empowering speech from Labour leader Jeremy Corbyn defined Saturday at Glastonbury Festival 2017. The order of the day was love, which is apparently all you really need. The Bootleg Beatles opened the Pyramid with a Sgt. Peppers-era set that featured a the likes of ‘A Little Help From My Friends’, ‘Penny Lane’, ‘I Am The Walrus’ and ‘A Day in the Life’, though I was personally disappointed they didn’t add the extra twenty verses recently written by Peter Serafinowicz. I was able to dash across the site to catch the entire Whitney set, which was an uplifting surprise despite the weather. The fresh-faced American band, led by drummer/vocalist Julien Ehrlich, wooed the crowd with their hazy Americana tunes and sarcastic banter. It’s rare for me to get so entranced by a band after just 45 minutes of listening but I’m keen to hear more now. The Thundercat set on the West Holts Stage was a showcase of musicianship masterclasses, though it was married with a penchant for memorable and soulful delivery by frontman Stephen Bruner. One defining moment of the day came from an empowering speech from Labour leader Jeremy Corbyn. He spoke for around ten minutes to a packed crowd in the Pyramid and it felt like everyone in attendance took a step to the left, no matter where they started from. Admittedly, he was inevitably going to be popular here, but he’s quickly becoming the voice of a generation that seemed for so long to have nobody fighting their corner. The next five years will be the most interesting politically Britain has seen for decades. From the stirring to the boring, The Kaiser Chiefs blandly went through he motions of their set to an indifferent crowd clearly waiting for Liam Gallagher to appear. This kind of band brings out the worst in middle-aged people clearly harbouring dormant lad culture personas inside their older bodies. Out come the Kangol hats, Oasis t-shirts and angry alter-egos and, some eight pints later, everyone can have a fight. Wonderful. Liam put in a solid performance, mind you, with a mixture of tracks from his upcoming ‘As You Were’ album and Oasis hits (up to and including 1997 but no later). The National underlined the 10+ recommendations I’ve had from friends who clearly have better music taste than me. They were brilliant and had the crowds singing along. I’ve no idea how they’ve slipped through the net thus far but they’ll be unslipping very shortly. The absolute hands-down 100% best set of the day came from Foo Fighters. They performed for well over two hours, providing hit after hit from their eight studio albums and their upcoming ninth album Concrete and Gold, due for release later this year. Starting with ‘Times Like These’, which was sweetly dedicated to Florence Welch, they blasted through a set that included ‘This Is A Call’, ‘All My Life’, new single ‘Run’, ‘My Hero’ and ended on fan favourite ‘Everlong’. The crowd didn’t want them to stop, so just carried on the chanting from ‘Best of You’ as they dispersed. Special mention to Taylor Hawkins and Dave Grohl for duetting on ‘Under Pressure’, doing their best impressions of David Bowie and Freddie Mercury. A classic moment. If only I could get those songs out of my head I’d be able to sleep better!